Do you know what kind of chemicals are in that household cleaner sitting under your sink? No, really—that’s not a rhetorical question. Do you know? I’m going to be honest with you. I don’t know what sodium dodecylbenzene sulfonate is, but it’s in most cleaning products (really). I don’t know what 2-hexoxyethanol is either, and so is that. I do, however, know what the ingredients are in a bottle of lemon essential oil… lemons. Personally, I prefer to know exactly what kinds of ingredients I’m exposing myself, my family, and our pets to, even if it takes a few extra minutes of prep. 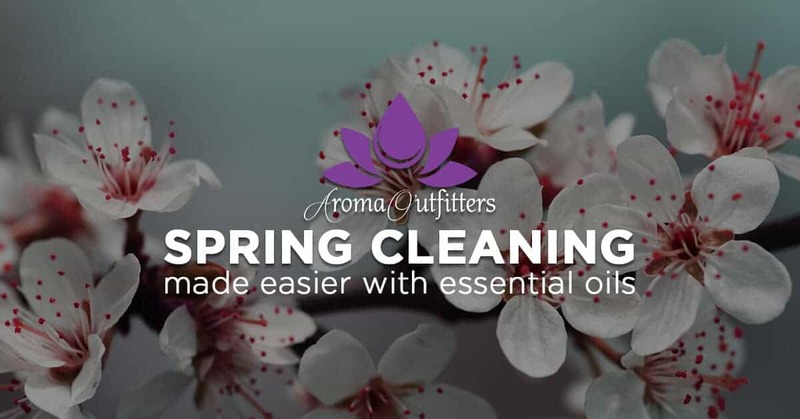 In fact, those of you who have been reading the Aroma Outfitters blog for a long time already know that my interest in essential oils was really kicked into high gear when I decided to ditch the store bought cleaners in favor of all natural, organic cleaners. So with all that in mind, today I’d like to share with you seven super cool time-saving “hacks” to make cleaning your home with essential oils even easier! The oils discussed below can be used in a variety of ways, but generally you won’t want to use them by themselves. To make a cleaning solution, you can use 3 cups of diluted castile soap (preferably with distilled water) and add about 30 drops of your preferred oil. Shake well and you’re ready to go. Similarly, for spray-based cleaners, get yourself a few 4oz glass spray bottles. Fill with distilled water and a capful (about 3 tablespoons) of vodka, witch hazel, or rubbing alcohol, then add your essential oils. 30 drops will work well here too—if you were making an air freshener spray you wouldn’t use quite as much essential oil, but we want our cleaning spray to be a bit stronger. Let’s dig into the cleaning hacks! You know how tons of store-bought cleaners are lemon scented? That’s because there’s definitely truth to the idea that lemon is a great cleaner (you just don’t need all the other stuff). Lemon essential oil is great for cleaning just about anywhere in your home, but it really shines—pun intended—when used to remove grease. Scrub your pots and pans with it, or if you have a particularly busy kitchen, you might even want to hit the floor. It won’t damage your flooring, but it will sop up grease buildup like nobody’s business. You know how much I love lavender essential oil. If you haven’t already, make sure to read my mega-post about lavender: Everything You Need to Know About Lavender Essential Oil Benefits & Uses. Lavender is amazing for a lot of things, so it shouldn’t come as any surprise that it has really powerful odor-busting properties. Using the spray bottle technique mentioned at the top of this post, you can spray a lavender oil mixture onto your curtains, rugs, sheets, or just about any other kind of fabric to quickly fight odors—and keep them away too. Mites a disgusting little bugs that love to live in dust, especially in the hard to reach places like under beds and couches. Fight away these unwanted house guests with eucalyptus essential oil by putting a few drops onto cotton balls and leaving them in cabinets and other places where pests might crop up. You can also use eucalyptus to give your clothing, bedsheets, or anything else you have in your washing machine a very fresh and clean scent. Just put 2-3 drops right in the wash! Cinnamon essential oil is perfect when used in a spray bottle (instructions above). After cleaning away signs of mildew in corners or anywhere else it appears, spray the area down with diluted cinnamon essential oil to prevent regrowth. However, do make sure that you’re using witch hazel, rubbing alcohol, or vodka in your spray—this will ensure that it dries out quickly. Similar to lemon, so many store bought cleaners have “pine” in their name. Pine is indeed an excellent cleaner, particularly useful for fighting off germs in the bathroom. Use a cleaning solution or spray everywhere in the bathroom from the toilet to the shower and your throne room will sparkle and smell nice! I think that thyme essential oil is an underappreciated essential oil. It has many applications and has a wonderful scent. I like to use it to clean my cutting boards and other kitchenware because it’s so powerful at fighting germs. Peppermint essential oil is a personal favorite of mine. I like to use it for everything ranging from my diffuser to fighting off sugar cravings. What you might not know is that it’s a powerful ant and spider fighter. The next time you have ants or spiders show up in your home, clear them away and spray the area with diluted peppermint oil. They won’t be back anytime soon. Dilute unscented liquid castile soap with distilled water, enough for 3 cups. Alternatively, fill a glass spray bottle with distilled water and 3 tablespoons of witch hazel or vodka. Add about 30 drops of your preferred essential oil. Lemon works well for stubborn grease stains. Lavender can get rid of odors. Eucalyptus is a natural dust mite repellent. …Plus the other great oils we discussed here today. It’s that simple!